A STABLE OF ROCK-SOLID WAYS TO LOCK-ON TARGET. 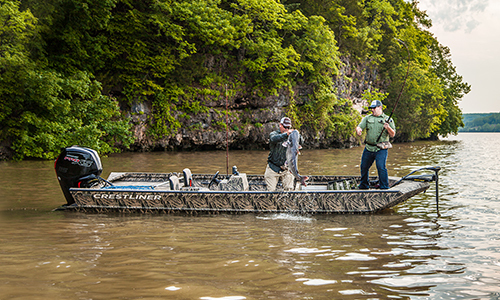 Hunt and fish your way with our lineup of Hunt/Utility boats. 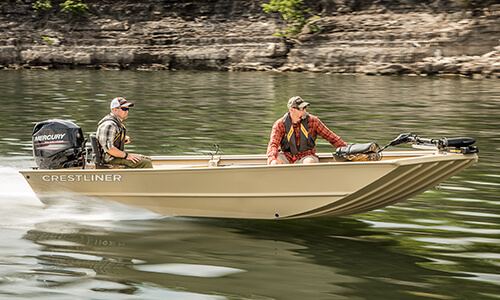 Durable and easily towed or carried, these boats are ideal for those who enjoy a simple, straight-forward layout and appreciate the versatility to hunt or fish. Crestliner’s signature all-welded hulls provide a stable platform to shoot or cast from across the lineup. And its strength means you can utilize every square inch of the water you’re on. With engines that run the gamut of high-horsepower in Retriever CC/SC and SCHD to smaller outboards with tiller steering in the Outreach and CR Jon, there’s no shortage of ways to get on the water. The forward center console design of the Retriever FCC, combined with a jet engine tunnel hull, makes it perfect for navigating shallow waters with ease. Built for the all-season outdoor enthusiast, the Retriever CC/SC combines function, storage and access to gear from bow to stern. Built to battle big fish and come out on the winning side, the Retriever SCHD is built from thicker-grade aluminum with a 60-gallon livewell to give any angler an advantage. The Retriever Jon Deluxe is a capable hunting and fishing rig with a wide open floor plan ready for every outing. 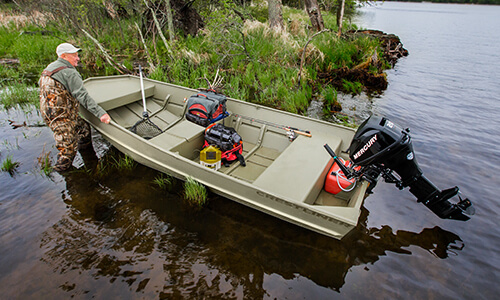 Everyday dependability meets practical performance in the Retriever Jon for those who demand a lot from their boat. Add no-frills performance and impressive strength to your next fishing or hunting trip with the CR Jon. The workhorse Outreach is suited for anglers and resort owners looking for trusted durability and functional design. With a Deep-V hull and rugged simplicity, this boat is built to perform. These boats are built with a singular purpose: to take down your preferred target. Whether you are hunting or fishing, you need a solid platform to shoot and cast from. 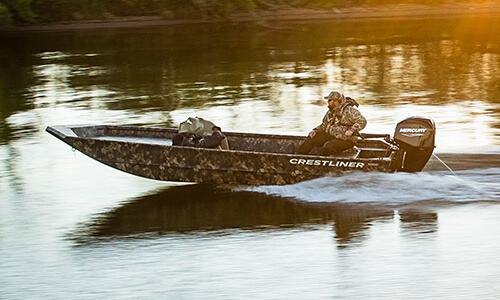 Each boat in the Hunt/Utility lineup features Crestliner’s strength and durability so you can confidently navigate any body of water. Once you reach your destination, they give you rock-solid stability so you know when opportunity arises, it won’t pass you by. 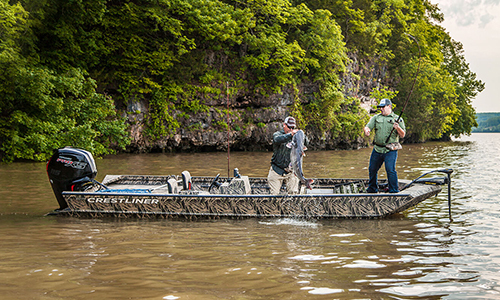 Our Hunt/Utility lineup features no-nonsense boats that are built for the task at hand. They include optional camouflage paint, elevated bow casting decks, and built in benches so you have every advantage over your intended target. With ample space throughout each model, you can bring family and friends along for the adventure. Or just grab your gear and make it a solo mission. 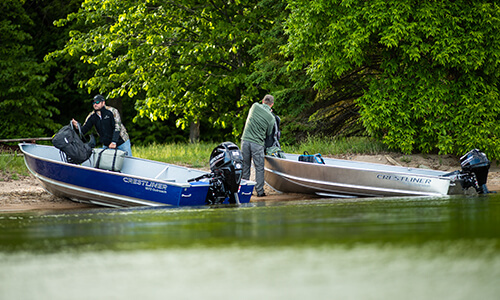 Crestliner Hunt/Utility boats feature ample space for all of your gear no matter if you are hunting, fishing, or both. Everything can be placed throughout the boat so you can have your gear handy where you need it. And with the lock track gunnel system allowing you to place any tools you need on the gunnel of your boat, you are set to have a memorable day. Our Mod-V boats are engineered using a multipiece design with formed-in strakes built into the construction. And when they are welded together, it produces superior strength, stability and durability. Our advanced broad beam design offers more deck space, and the continuously welded seams on our hull create unbeatable strength and a watertight fit. The result is a boat that stands the test of time and is built to perform. *Some optional equipment shown. Not all features apply to all models. See model page for full details. Buying a hunting boat comes with a lot of considerations. 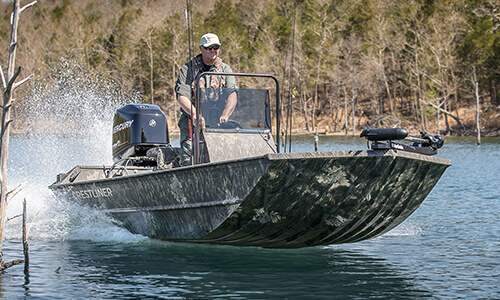 Tip the scales in your favor with our guide to buying a hunt/utility boat that’s right for you.